Producer: Unknown – I do not have the box anymore, if you know the producer and the series, could you please share? 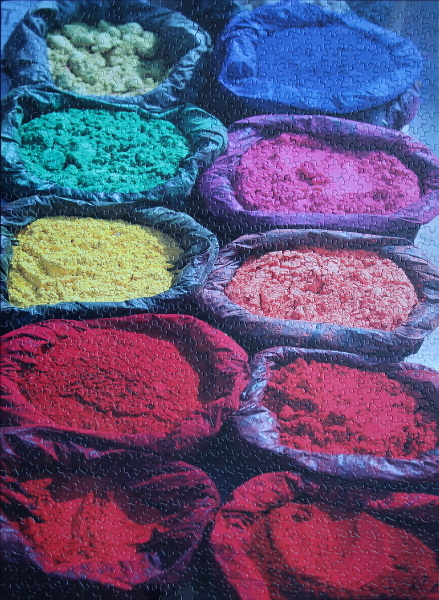 Puzzle: Not a trivial puzzle to do due to many similar regions and the lack of large uniform colour patches. One could start with the bright accessories – the ribbon, the bouquet, small flowers, the butterflies, the feather, the hair piece, and the round peacock feather. 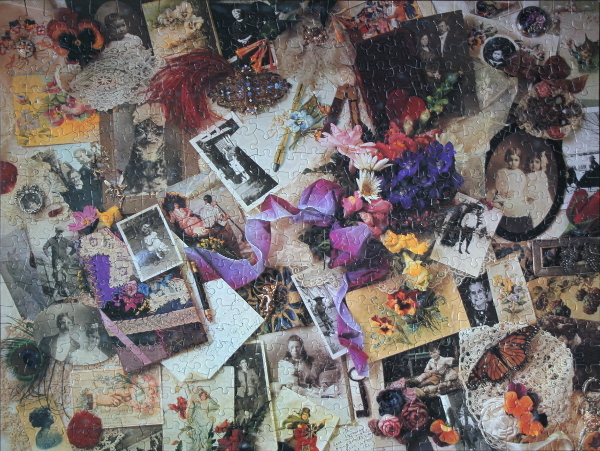 The brighter white and yellow postcards and letters can be filled in afterwards, as well as the black photos and the photo in the black oval frame. 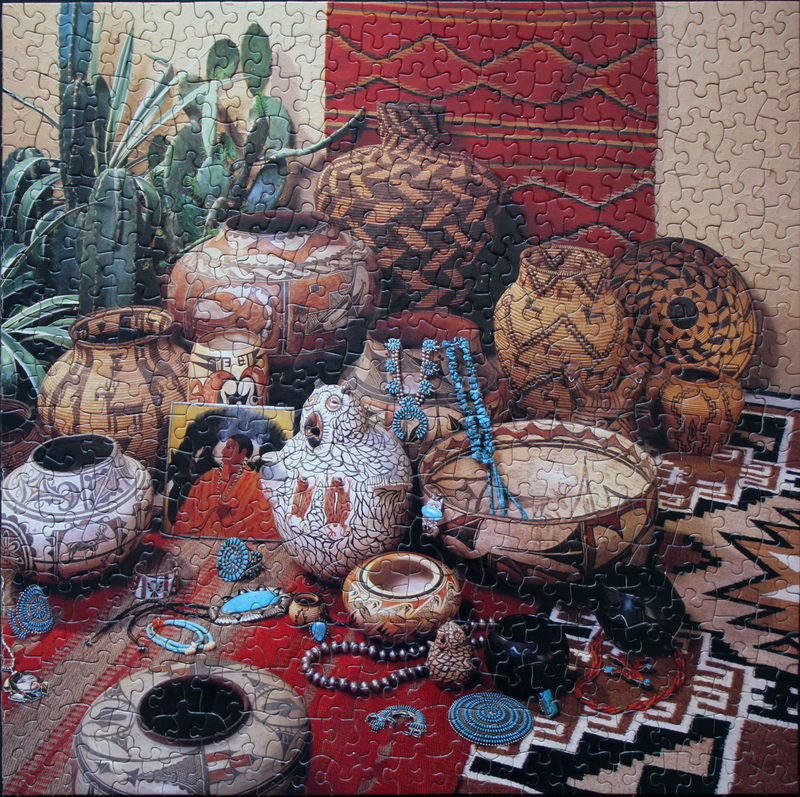 For the rest of the puzzle, it takes a bit of time to complete, but as the pieces are large and it’s not a big puzzle, I would not say it is hard. Puzzle: A Mother’s Cupboard series puzzle (there is another Blue by You one), small and simple to assemble. 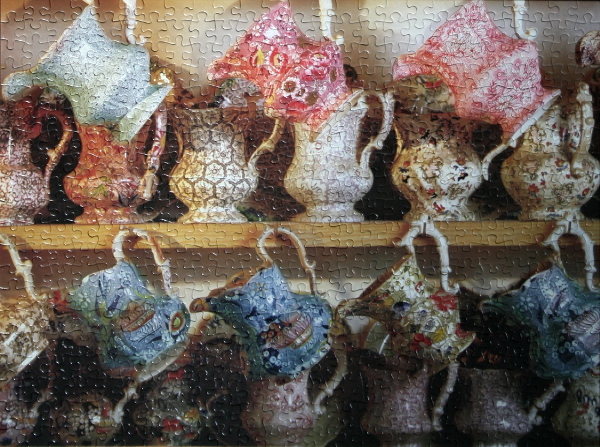 It’s easiest to start with the shelf, since it splits the picture into two regions. The brighter pink and blue cups, as well as the hanging cups handles can be assembled next. 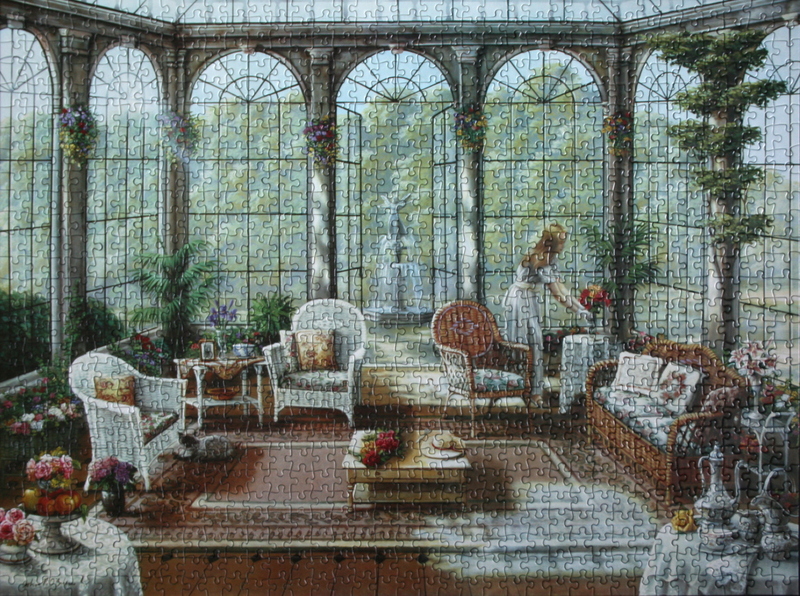 Since the puzzle is small and the pieces fit together well, the rest should be easy enough to complete. 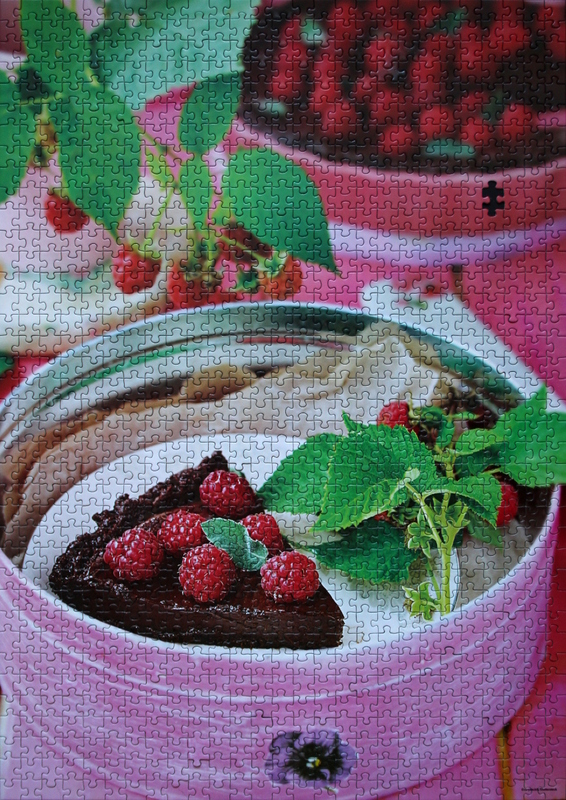 Puzzle: A Mother’s Cupboard series puzzle (there is another Afternoon Tea one), small and simple to assemble. 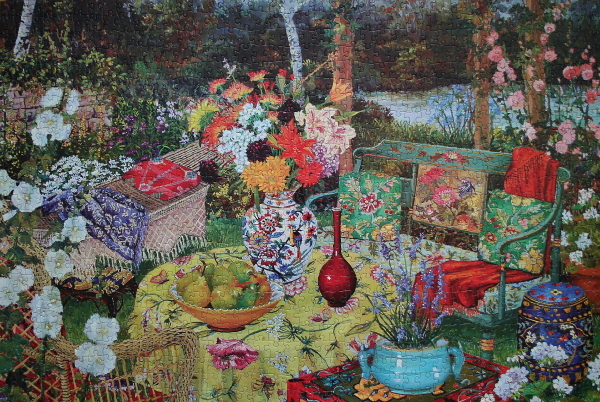 The good regions to approach first are the basket, the wooden box, the flowers, and the horizontal shelf. After that the rest of the pieces are quite similar and might take a little time to place. Notes: A lovely and zen puzzle to assemble. There are many ways to approach it: I have started with the tallest bottle and the tall jar with orange contents, followed by the red flowers and the blue fence in the background. The red peppers, white towel and garlic, the basket, and cut up lemons and limes followed. The fruit in the basket and under it came after, and the rest of the pieces came together easily then. 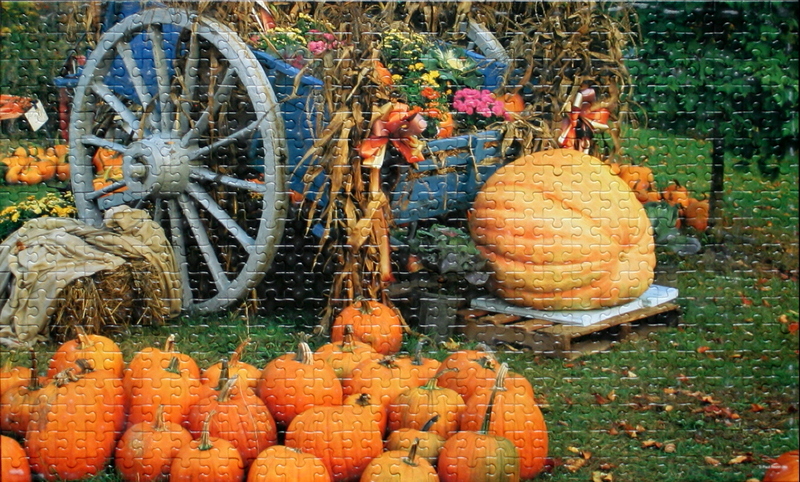 Puzzle: Some days I like nature mort compositions. This one is not completely trivial, since there are so many white areas and most cups look similar, but it is small enough for that not to present too much challenge. 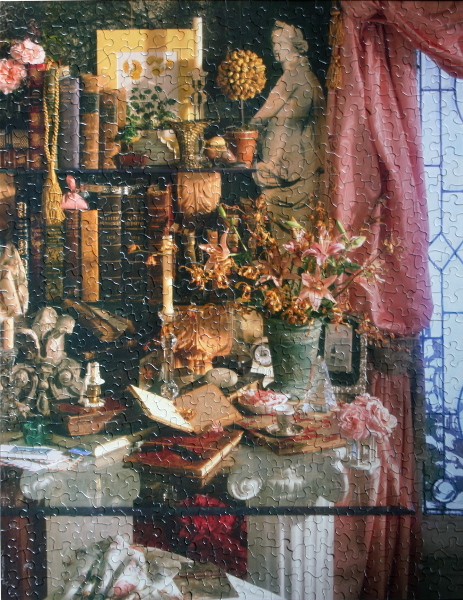 The shelf is the easiest place to start, as it separates the puzzle into two areas providing a good horizontal guide. 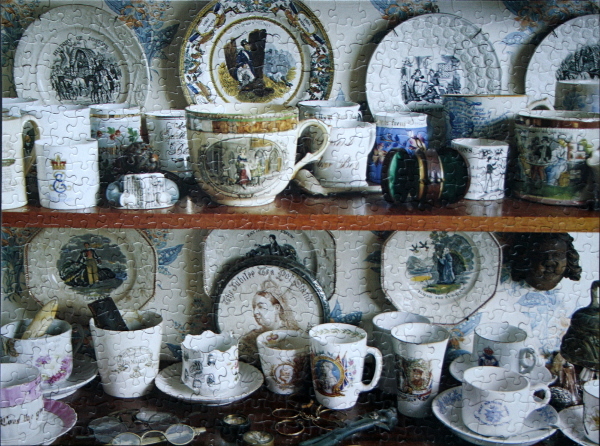 The distinct colour areas such as lavender and blue cups, as well as the round edges and patterns on the plates are easy to assemble, as well as the glasses on the bottom shelf. The wall pattern and the rest of the cups can follow. Puzzle: Beautiful puzzle, gentle colours, the pieces fit together well. The repetition of the window parts makes for a bit of a challenge to assemble the largely-similar window grids, but there is enough variation in the room furnishings bordering the backdrop to make the assembly enjoyable. 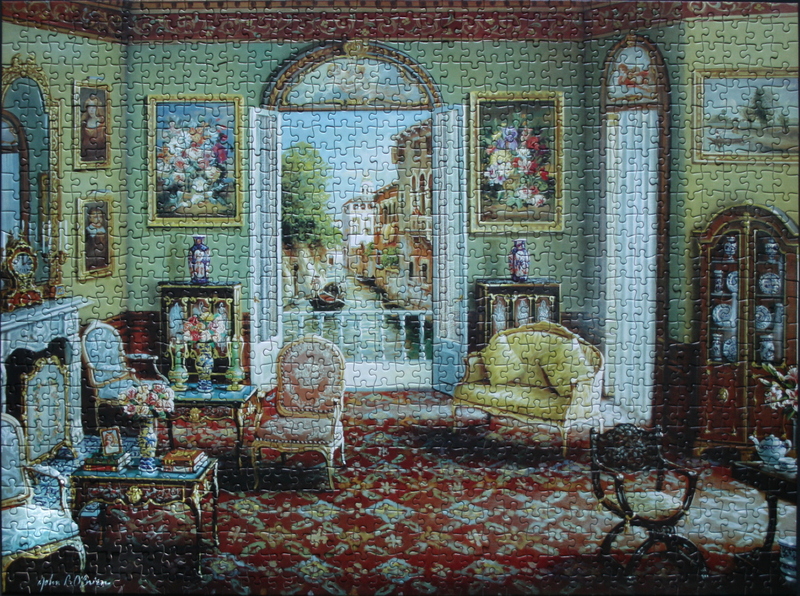 I have started with the window tops and continued with windows themselves, although it might be easier to first focus on the armchairs and sofa, corner tables, plants, the rug and the floor. Either way the large sections separating the windows provide good vertical guides whereas the rug pattern and the rug/floor border make for horizontal guides that can direct the assembly. Puzzle: This puzzle is a pleasure for the eye. Lots of vibrant colours and small details. 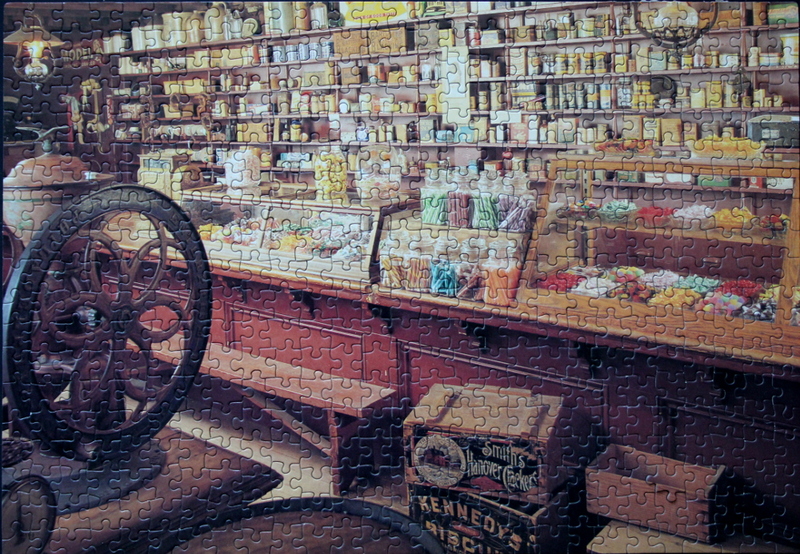 The pieces fit together well. 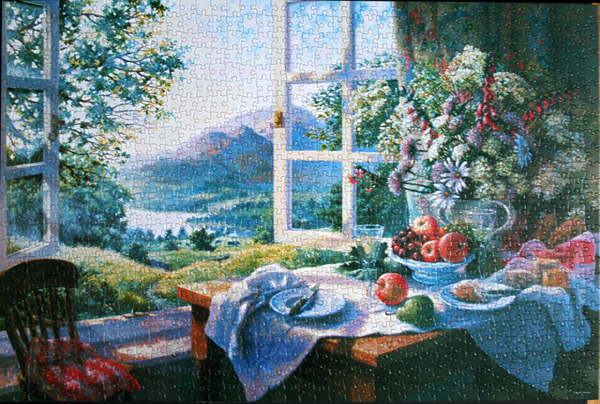 The easiest regions to start are the vertical guides of the balcony doors and the white tall window, the street with the sky and buildings, the paintings and their frames, the dark red border decoration at the top of the walls, and the green of the walls themselves. The cupboard, the chairs and love seat, and the fireplace can come next, with the rug pattern to follow. 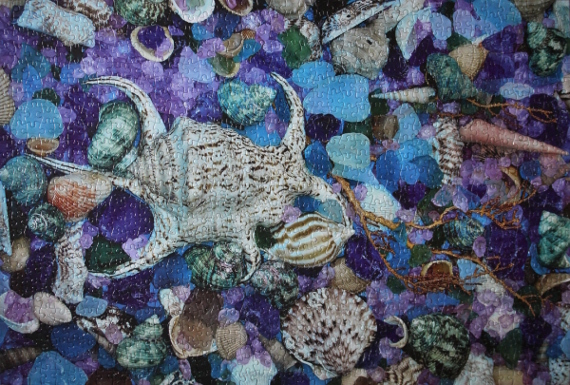 The rest of the small details can then be filled in. 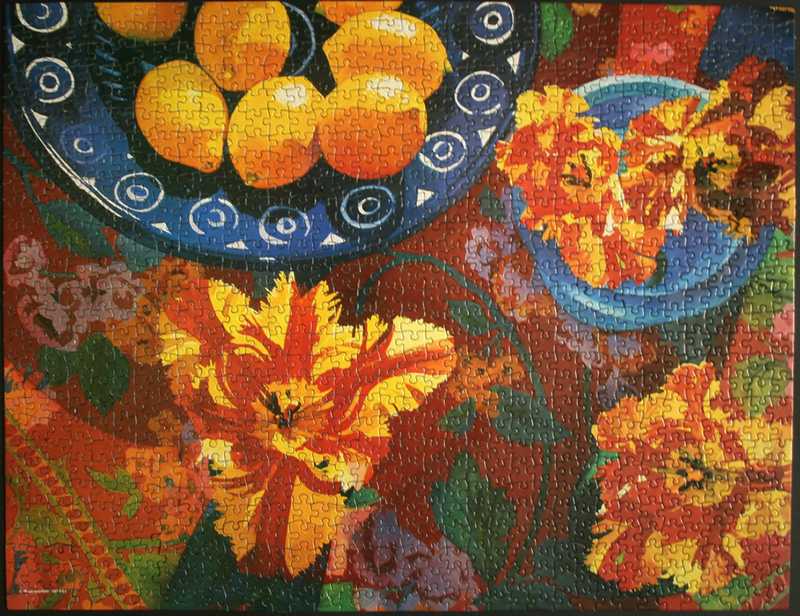 Puzzle: Leisurely puzzle to make, with pieces fitting together reasonably well. 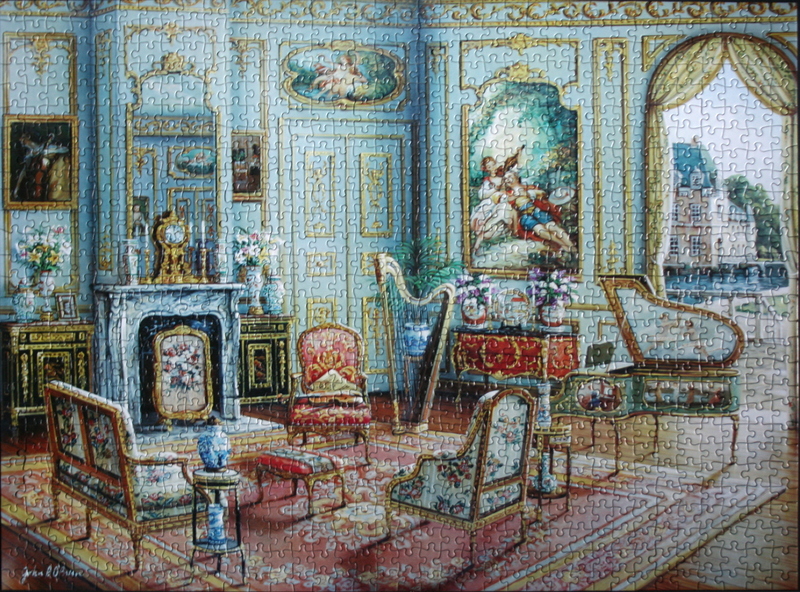 Many possible places to start: vertical guidelines of the gold embellishments on the white walls, the opening into the street with buildings and draperies, the border of the floor and the rug, the red regions of the furniture and the darker regions of the paintings, the fireplace, and the side tables with flower vases. The harp and the piano, the furniture pieces, and the rug can then follow, and the rest is relatively simple. Lots of little details, visually a very rich puzzle for the eyes. Puzzle: A very rich puzzle in terms of colours and arrangement. One of the ways to approach it is to start with the larger areas of similar colour: red flowers, yellow ones, large pink and striped ones. 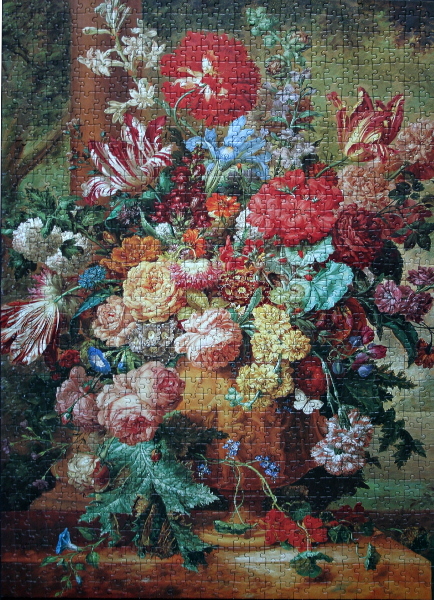 After that, the vase and the table, as well as larger green leaves, blue stand-alone flowers, the butterfly, and the pastel flowers can be tackled. 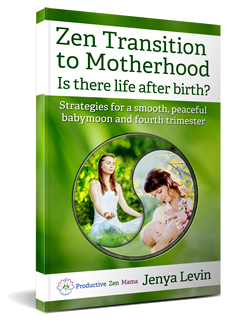 The pillar in the left top quarter separates the top area into three distinct regions and can be used as a vertical guide. The rest of the arrangement fills out easily from there. 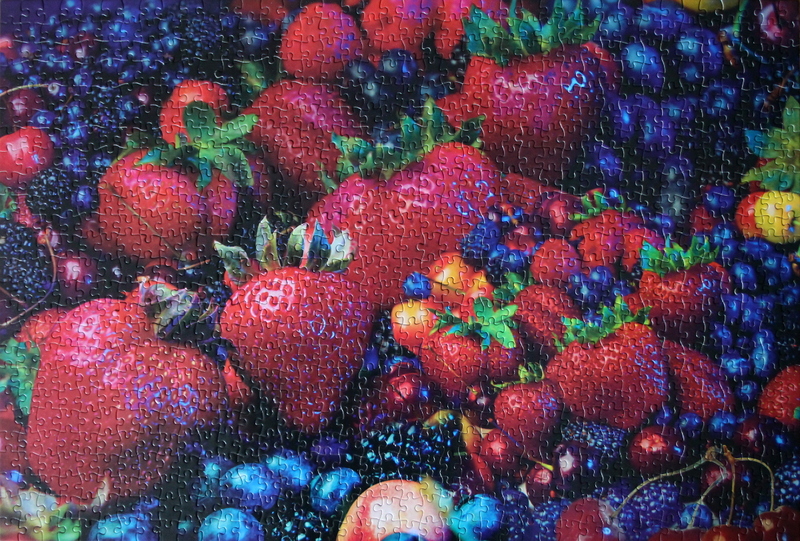 Overall, a very enjoyable vibrant puzzle, made with good quality paper. Puzzle: This puzzle is not trivial, but not significantly difficult either. 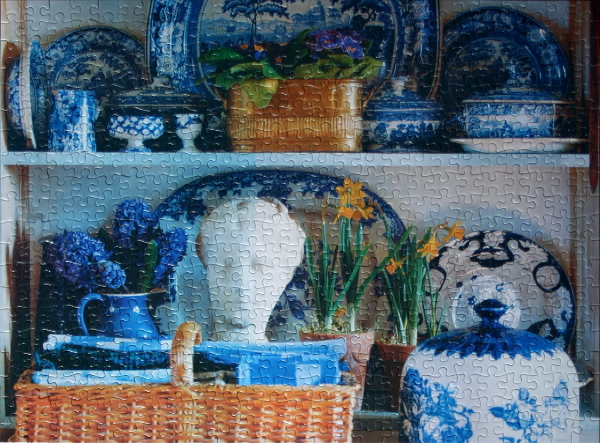 Large blue dish with white spirals and smaller blue dish give a good outline to the top half of the puzzle. 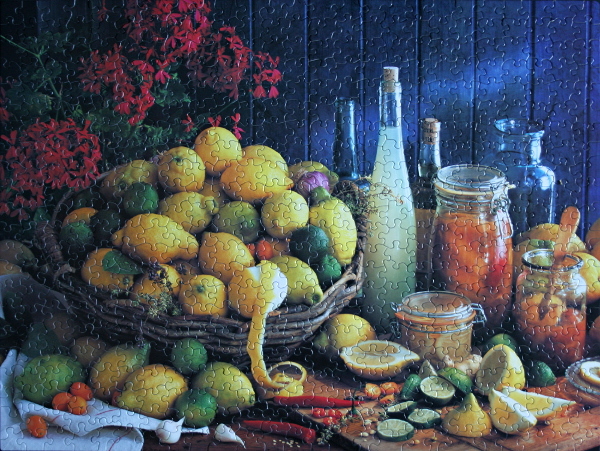 Lemons can be filled in afterwards, as well as the lilac-coloured flowers. From that point on, green, yellow, orange, red, and brown patches are equally challenging: I ended up finishing with the tulips, but perhaps a reversal might have been easier.